Today marks the beginning of Native American Heritage Month. Along with other museums, parks, and libraries across the country, The National WWII Museum is paying tribute to the heritage, tradition, and military participation of American Indians. Students and teachers can connect with us through videoconferencing for our Continuing the Warrior Tradition Virtual Field Trip. Similar to many minorities participating in the war effort, American Indians were confronted with discrimination and stereotyping on the home front and battlefront. Despite this, 99% of eligible Native Americans registered for the draft by 1942. This was the highest percentage of any ethic group in the country. One of my favorite stories to tell students during the Virtual Field Trip is of the Navajo Code Talkers. 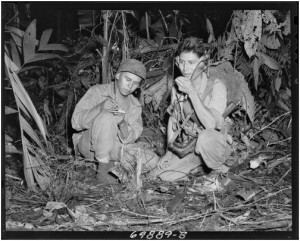 These young Native American men transmitted secret communications on the battlefields of the Pacific Theater. It was estimated that only 30 non-Navajos knew the language, meaning it would be the most secure code to use on battlefront. This proved true; the code remained unbreakable by the Japanese during the war. The training process of these American Indian Marines was truly exceptional. Since Navajo was only a spoken language, it was necessary to create a written alphabet. There wasn’t a translation for modern military lingo, so these words had to be created as well. In addition to combat training, the Code Talkers had to master and memorize 450 Navajo words at Marine Code School. The code manuals could never leave the facility. The code proved so successful during WWII that the United States kept the project classified until 1968. The Code Talkers weren’t universally recognized until 2001, when they received Medals of Honor. Interested in hearing more of these fascinating stories in your classroom? Book Continuing the Warrior Tradition or any other Virtual Field Trip today!